We’re about mid-month in the World Watercolor Month celebration….are you having fun? Hope you’re following along with my daily posts on Instagram and Facebook – and joining in with the prompts yourself too! Every once in a while…I make an autobiographical card: this is me arriving at my monthly stamp group. LOL! Yes, some of us are already in place on our trapeze. Others arrive in a bit of a state of disarray, feathers a-flying…. Watch the video below or click HERE to see it in HD on YouTube. 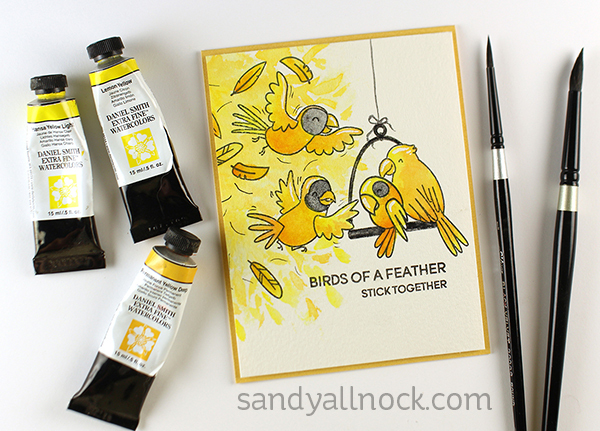 Even with just a limited color palette, watercolor can make for a fun card…if you’ve never tried any watercolor, pick one and try your hand! I love this “messy” style, you are such a great artist Sandy! This is just so so fun! I love this stamp set and your great card! So cute you always make me smile. As always thanks for all your sharing of techniques and ideas,am loving this month of cards and creations. Love this! My daughter and her 2 little boys were here today and the 4 of us were all sitting around water colouring, such fun! They look happy even if in chaos mode. 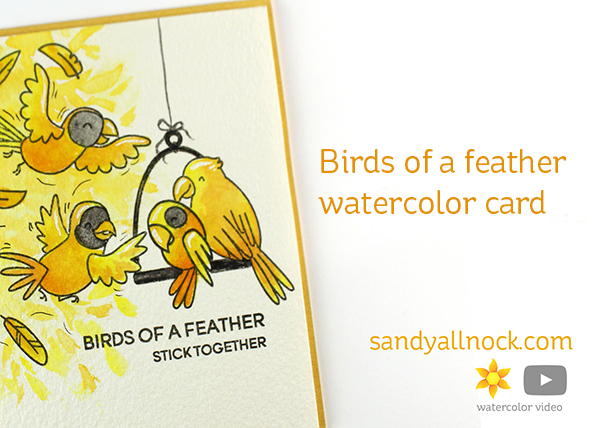 Love your birds of a feather card! Oh how cute! And the funny story! That is an adorable stamp set and I love your yellows! Nifty stamp set – and I love the name of it – “Wingman”! Also – good to know that even the experts have cards going in a direction that wasn’t planned… altho it happens to me a lot more often! This one turned out great, tho – what a hoot!